Metropolitan Musings: What Inspires You? Sir Richard Burton: The Ugly Englishman? He experienced a great deal more. During Ramazan, for example, when the faithful [including a disguised Burton] are expected to fast for 16 hours each day (not even swallowing their spit! 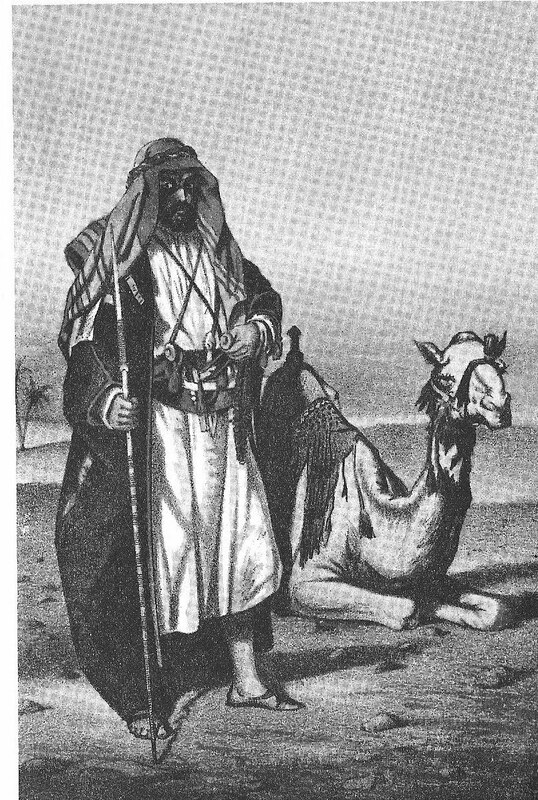 ), his traveling companions grew increasingly bad-tempered; the daily heat took its toll so they traveled at night; and they were harassed almost daily by Bedouin tribesmen intent on raiding. After many armed skirmishes, the caravan arrived safely but tattered and were hosted by one of their party who was a rich, middle class sheik (Shaykh Hamid). The travelers then blossomed from rags (when they wished to be unknown) to fine linen suits of clothes (to establish their prosperity). “The dirty, torn shirt, with the bits of rope round the loins, had been exchanged for a Jubbah or outer cloak of light pink merinos, a long-sleeved Caftan of rich flowered stuff, a fine shirt of Halaili, silk and cotton, and a sash of plaid pattern, elaborately fringed at both ends... His pantaloons were also of Halaili, with tasteful edgings about the ankles like a ‘pantilette’s’,[sic] while his bare and sun-burnt feet had undergone a thorough purification before being encased in new Mizz (inner slippers), and Papush (outer slippers), of bright lemon-coloured leather of the newest and most fashionable Constantinopolitan cut. The Sheik’s House and Furnishings. “Hamid’s abode is a small corner building ... the ground floor shows only a kind of vestibule, in which coarse articles, like old Shugdufs, mats and bits of sacking are lying about; the rest are devoted to purposes of sewerage. Ascending dark winding steps of ragged stone covered with hard black earth, you come to the first floor, where the men live. It consists of two rooms to the front of the house. “One room has dwarf windows, or rather apertures in the northern and eastern walls, with rude wooden shutters and reed blinds; the embrasures being garnished with cushions, where you sit, morning and evening, to enjoy the cool air. The ceiling is of date-sticks laid across palm-rafters, stained red, and the walls are of rough scoriae, burnt bricks, and wood-work cemented with lime. The only signs of furniture in the sitting-room are a Diwan [see below] round the sides and a carpet in the centre. “Behind the rooms is a dark passage, into which the doors open; and the back part of the first story is a long windowless room, containing a Hanafiyah, or large copper water-pot, and other conveniences for purification. A huge wooden box, like a seaman’s chest, occupies one of the corners. In the southern wall there is a Suffah, or little shelf of common stone, sunk under a single arch; upon this are placed articles in hourly use, perfume-bottles, coffee-cups, a stray book or two, and sometimes a turban... Two hooks on the western wall, hung jealously high up, hold a pair of pistols with handsome crimson cords and tassels, and half a dozen cherry-stick pipes. “The center of the room is never without one or more Shishas (water pipes), and in the corner is a large copper brazier containing fire, with all the utensils for making coffee either disposed upon its broad brim or lying about the floor. The passage, like the stairs, is spread over with hard black earth, and is regularly watered twice a day during the hot weather. The Diwan. “The Diwan is a line of flat cushions ranged round the room, either placed upon the ground, or on wooden benches, or on a step of masonry; varying in height according to the fashion of the day.... Cotton-stuffed pillows, covered with chintz for summer and silk for winter, are placed against the wall, and can be moved to make a luxurious heap; their covers are generally all of the same colour, except those at the end. The seat of honor is denoted by a small square cotton-stuffed silk coverlet, placed in one of the corners, which the position of the windows determines, the place of distinction being on the left of the hose. Daily life. “At dawn we arose, washed, prayed, and broke our fast upon a crust of stale bread, before smoking a pipe, and drinking a cup of coffee. Then it was time to dress, to mount, and to visit ... one of the Holy Places outside the city. Returning before the sun became intolerable, we sat together, and with conversation, Shishas and Chibuks [Syrian tobacco), coffee, and cold water [the interior of water jugs are] perfumed with mastich-smoke], we whiled away the time till our dinner, which appeared at the primitive hour of 11 a.m. Source: Personal Narrative of a Pilgrimage to Al-Madinah & Meccah, by Sir Richard F. Burton.